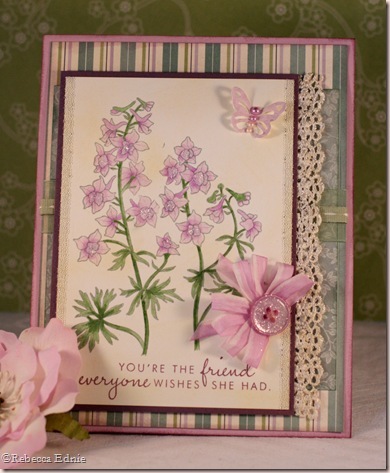 Joan’s Garden’s Challenge this week was to use purple and green, a butterfly and a strip of DP. Well, I used a bit more than a strip of DP so I hope she will overlook that! I coloured my own ribbon, again! creating striped ribbon this time. I used a V000 for the base colour and and V12 for the striping. I created a bow with my Bow Easy and arranged it into a half circle with a huge dimensional glue dot. I left half of it free to attach the button. So guess where the lace came from? It was from a nightgown I wore to death! I kept the lace because it is still like new! One edge was sewn to the old fabric so I cut it off and that left a raw edge so this layout had a perfect place to place it where that would be hidden. I added beaded edges to the main panel using Scor-Tape. The layout is Sweet Sketch 54. I though it was the latest one but I copied it off of someone’s blog and I guess they were playing an old one. I was so disappointed when I saw that! I am really trying to play more sketches and challenges. Next postGuess What? Design Team Opportunity! Beautiful card! I love the colors and lace! Gorgeous card! All the lovelies on it make me drool!